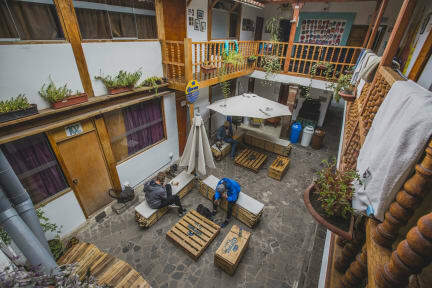 Yamanyá Backpackers Hostel Cuzco is located in a beautiful Republican house in Cusco's historic centre, and offers you warm, comfy beds, free breakfast, wi-fi and internet, steaming hot water and a huge guest kitchen. Shoot pool in our bar, chill out with a movie on our high def LCD and DVD, relax in our comfortable common areas.... or for something more exciting head to the in-house Yamanyá Tours for a huge selection of tours and activities in Cusco, to the Sacred Valley or Machu Picchu. Great place to stay in Cusco. The staff was extremely helpful and everyone is very friendly. Great comfort in the rooms and lots of space to organise your stuff! The best hostel in Cuzco but in Peru also!!!! All good! Staff very helpful and kind! Beds were so so comfortable and the location is very very nice! Very safe and clean! Free mate de coca all night and all day, food was super and rooms warm and nice . You can have your privacy even if you are in the dorms because you have curtains in each bed! Super recommended!!! Primero, no crean al 20% de descuento reservando con ellos en otro kokopelli hostel. Yo lo hice cuando fui a Lima y el precio con 'descuento' era exactamente lo mismo del precio normal en hostelworld o booking! Un estafa!!!! Segundo, había muchos voluntarios que no sabían ni una palabra en español y nisiquiera te saludaban con hola. No parecía de estar en Perú!!! !terrible!